To the haughty fellows who insist that ladies only drink girly-drinks with sugared rims and "tini" stuck at the end of the cocktail names, they clearly haven't met the ladies of LUPEC. And they'd better be wearing a cup if they dare say it in the company of these saucy birds. Started in Pittsburgh just shy of a decade ago, the Ladies United for the Preservation of Endangered Cocktails (LUPEC) was a spirited society created to spread the word about lesser-known libations, preserving their heritage, and promoting the art of a properly-made drink. There are chapters of LUPEC across the country, so it's no surprise that in the foodie-verse of Puget Sound, there would be a Seattle chapter. The Prime attended their December meeting, hosted by the delicious folks at Spur. I had heard recommendations from other bartenders in the area that the ladies of LUPEC would be a fun crowd, and they were not mistaken. Meetings are held every month at a different spot around Seattle. This band of cocktailians and foodies gather to drink, eat, and discuss all things spirit-related. The mood is convivial and welcoming, with members coming from both corporate cubicle life, as well as the food/drink industry, bound together by the love and respect for quality drinks. This is a knowledgeable bunch, and I guarantee you will learn something new. I discovered you can replace the water for making pie dough crust with vodka -- amazing! It was like being at school. With alcohol. Spur was a great place to have the December meeting, and I had been meaning to try it out, so it was a win-win for me. They had two tables set up for LUPEC and passed around several plates of easy nibbles, like creamy truffle gougeres, salmon crostini, and a delicate butternut squash soup. They had a menu with two drinks made especially for the meeting -- I sipped on a light, fruity punch that packed quite a punch. I should have called this post: Why I Need to Get a New Camera, because sadly, most of the photos I took at the LUPEC meeting were too dark to post. Curses! My apologies, so I wanted to make it up to everyone with a drink and dessert. I was inspired by LUPEC to play around with cocktails and put the advice of a liquored-up pie dough crust to work. Taking a cue from seasonal ingredients, I made a Persimmon Rosemary Bellini, and a dessert version of the drink, a Persimmon Rosemary Tart with a Gin Crust. Since these are somewhat Wasabi Prime-created, I put the recipes below, to much OMG-ness, as I rarely list such things. The classic Bellini, created in Venice, Italy by Harry's Bar founder Giuseppe Cipriani, uses a peach puree with Champagne, commonly served at brunch and commonly getting one tipsy as all get-out. Stone fruits are long gone with summer, but I thought the sweet and tart flavor of a persimmon with rosemary would combine nicely with a bit of bubbly. Autumn has delivered the seasonal blessing of fruits like the persimmon, a brightly-hued berry that looks a little like a tomato with its taut, shiny skin, and is pleasantly sweet when ripe. If it's picked too early, it can be a bit tart or bitter. I found a handful of soft, ripened persimmons and wanted to try pairing its almost melon-like sweetness with the fragrance of rosemary. I thought of the Bellini because it uses a fruit puree, and the color would look good against the sparkling wine. Because the persimmon isn't as sweet as a peach, the fruit puree was combined with a bit of simple syrup, infused with fresh rosemary. Topped with bubbly, it made for a fall-themed cocktail that was both refreshing and flavorful. Pushing the same flavors further, the lightly sweet persimmon and pine flavor of rosemary seemed a good pairing for a dessert. Par-boiling and skinning the persimmons, they were cored and sliced thin, drizzled with some of the rosemary simple syrup. Taking the advice from the LUPEC meeting, I mixed a sweet piecrust dough, swapping alcohol for water. I wanted to keep the pine theme going, so I used gin instead of vodka, assuming it was a clean enough spirit to use for wetting the dough. I was warned that the alcohol would make the dough oddly moist, but simply push through the weird sensation and have faith in the spirit. True enough, while the dough was a bit sticky and required more flour to roll out, the evaporation of the alcohol produced a marvelously crisp and flaky crust and a heck of an alcohol vapor as I was opening the oven door to check on the baking dough. The resulting dessert was a freshly flavored treat that seemed more summery than autumn, and it was a nice break from all the heavier holiday foods that seem to be around us at every turn. I raise a Persimmon Bellini to the ladies of LUPEC Seattle for a fun night out, and thanks to organizers Wendy Miller, Stevi Deter and Anu Apte for keeping the spirits alive every month. Thanks also to Spur for their hospitality and delicious food -- I look forward to visiting again! I will keep my eye out for the next LUPEC meeting. For those interested in more information about LUPEC Seattle, and if you have a Facebook account, you can access the latest updates on their Facebook group page. To make the rosemary simple syrup, combined one part sugar to one part boiling water over the stove. Dissolve sugar, let mixture simmer for a few minutes with a large sprig of rosemary to impart flavor. Remove sprig and let the syrup cool before using. For the persimmon, par-boil the whole fruit to soften and help remove the thin outer skin. Rub off as much of the membrane as possible in an icewater bath before coring and slicing it into smaller pieces. Puree in a food processor or blender until smooth. 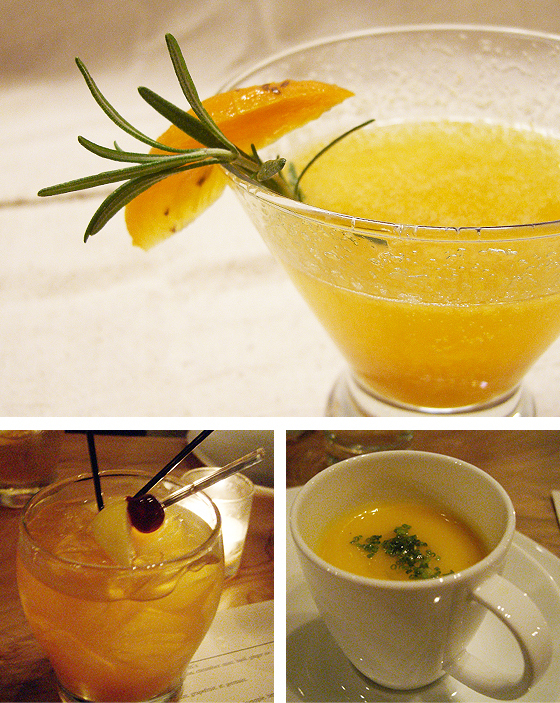 Take a champagne flute or other cocktail glass and spoon the persimmon puree and the rosemary simple syrup into the bottom. Combine and taste for sweetness, adding more syrup if needed. Carefully pour the Champagne over the top. Garnish with persimmon slice and rosemary sprig. Preheat oven to 400 degrees Fahrenheit. Roll out chilled dough -- the alcohol will make it wet and prone to breaking, so roll it carefully and use additional flour to prevent sticking. Place rolled dough into tart pan and dock the bottom with a fork to help release steam during pre-bake. Place tart crust in the oven for ten minutes to set, and remove to cool slightly before adding fruit slices. 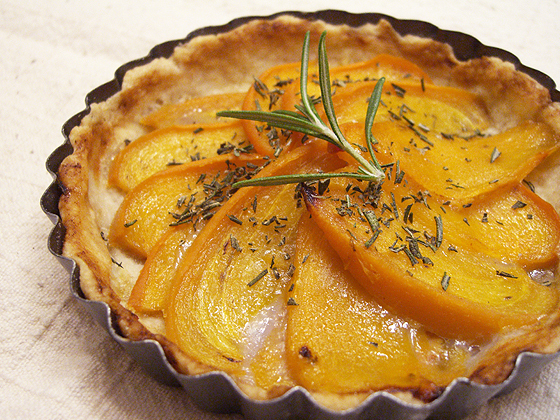 Take the persimmon slices and toss with rosemary simple syrup, sugar, and chopped rosemary. Arrange evenly in cooled tart crust. Brush some of the leftover syrup onto the exposed parts of the crust before placing back into the oven at a lowered temperature of 350 degrees Fahrenheit, and let it bake for another 15-20 minutes, until the fruit is slightly browned. Serve with fresh whipped cream, small scoop of vanilla ice cream, or just om nom nom it. The persimmon tart looks delicious, and the cocktails at Spur look great! Love their cocktails. Sounds like a fun event, how do you manage such fabulous invitations?! 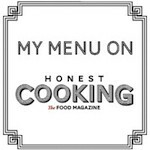 I'm intrigued by both recipes, particularly the persimmon rosemary bellini. I just happen to have both ingredients on hand, just need the champagne. we just had dinner at Spur last night! Your bellini looks SO good. Totally my kind of drink. What a fun event! Bellini and tarts - lovely! what camera were you using? these posts pictures look great. I just got my dslr, and although I havn't yet gone trigger happy I'm hoping my week long holiday coming up soon would change that. I'd hate to miss anything you take! on the other note I've actually never tried persimmon...lol. sad, but true. it sounds lovely as a cocktail! Such a great idea! I still have a few persimmons in my fridge. I got to try out this recipe. LUPEC, I love it! How did you find out about this? Sounds like so much fun.